Back when Mr. Karen and I were younger and more energetic, we’d take ski vacations in Colorado where we’d fly out of Michigan after work, get into Denver late, then get up the next day and head to Keystone, where they had night skiing so we could stay on the slopes ’til 8 or 8:30 at night. Schweitzer has night skiing on most weekends and holidays but until yesterday, I’d never partaken, unless you count a last run of the day that just happens to occur after the lights get turned on, which I don’t. But yesterday we got a late start because I decided I’d rather lounge around for a while in the condo and let the Saturday crowd thin out some, so I still had energy left when day skiing ended. Cool. I figured I’d just do some more runs during the night skiing session. Which I did, even though as part of the “12 Deals of Christmas”, night skiing was free yesterday, and lots and lots of people turned out for the evening. 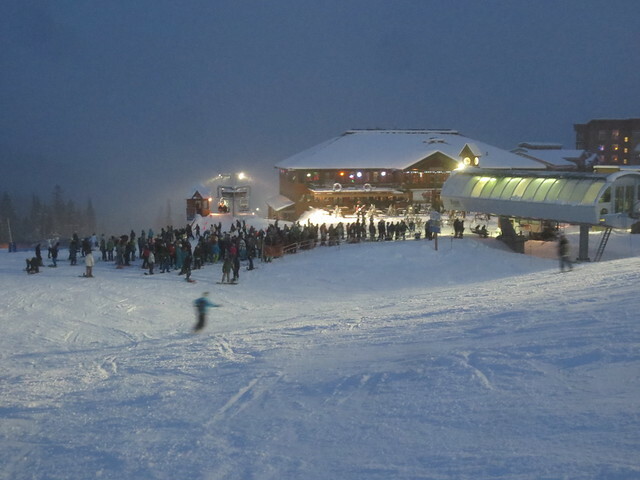 All day I’d skied right up to most lifts; suddenly at night, the lift was mobbed (well, mobbed by Schweitzer standards). Thank goodness for the singles line (Mr. Karen and I are often single for the purpose of riding ski lifts on busy days). 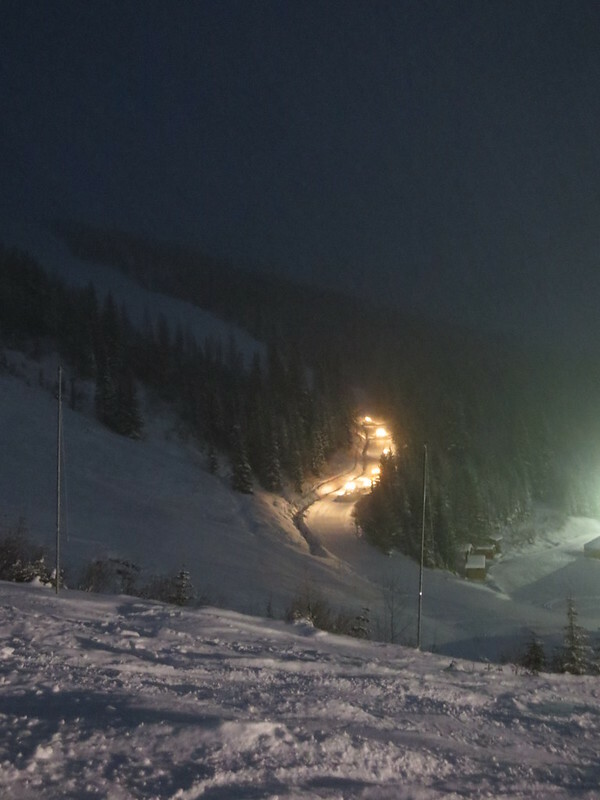 The interesting part about night skiing at Schweitzer, at least last night, was they didn’t rope off the runs that were unlit. So while the lift line was jam packed with people, I skied on uncrowded slopes by avoiding the lit runs until the twilight entirely faded. I saw a few people with headlamps, which I might try next time I get a hankering to stay out late on the slopes. A bonus to being out on the hill that late was getting to see the snowcat parade as the groomers made their way up to do their night’s work. In prior years here at Schweitzer, we rarely skied Saturdays, as we often traveled then and opted for the cheaper Sunday through Friday annual passes, as opposed to this year when we sprung for the unlimited annual passes. So far, we’ve used them every day except the first day after we got here, but I’m planning to break that streak soon. I’ve got all season; I don’t need to try and cram as many runs in every day as I can.